Prostage MIDI Foot Controller, True Bypass Looper, MIDI Switcher and Guitar Effects for professional Guitar Rig building. Welcome to Prostage - Your specialist for fully remote controlled guitar rigs. Prostage develops and manufactures advanced MIDI foot controllers and switching systems to control your entire guitar rig. The latest software offers native support for the Kemper Profiler, the Fractal Audio Axe-FX, the Avid Elevenrack and the digital guitar amplifiers from Line6 and Digitech. Further, it gives you the ability to work with songs and setlists rather than just recalling presets. Our aim is to process all guitar signals inside the rack. Thus, there are only remote control units at the front of the stage. Realtime effects, such as the pure analog Remote WahWah, are controlled with an expression pedal. You switch your amp channels and stompboxes using a MIDI foot controller. The effects themselves are fitted in the XDS Loop System. This is a 19-inch drawer with integrated true bypass looper and power supplies for guitar effects. Using a Prostage system, sound and dynamic losses as they appear when using long guitar cables belongs to the past! The Prostage devices are programmed very comfortably using the System Manager software for Mac and PC. The MIDI Foot Controller and Looper | Switcher are interconnected via StageWire. StageWire was developed by Prostage specifically for stage use. This stage-prove MIDI connection provides bidirectional communication of multiple devices via just one standard microphone cable from device to device. Further, StageWire also includes phantom power for the foot controllers. Up to 14 foot controllers and displays can be interconnected directly (daisy chain). Prostage was founded by Lukas Truninger, an experienced audio engineer and backliner from Switzerland. 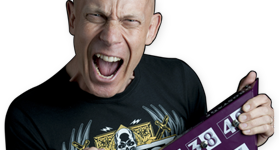 So far, Lukas has worked with several international touring bands, such as Krokus or the Pepe Lienhard Orchestra (Udo Jürgens), during the 1990s and early 2000s. During his work, Lukas has gathered a wealth of experience which has contributed to many construction details of the Prostage devices. Today, Wolf Hoffmann from "Accept" and "Flyleaf's" Jared Hardmann are only two of many guitarists successfully using Prostage products on their extended tours. MIDI controlled analog WahWah effect. MIDI controlled analog volume pedal. Buffer | Booster | Impedance matcher | Line driver. 19" Drawer with looper and psu for 8 Stompboxes. 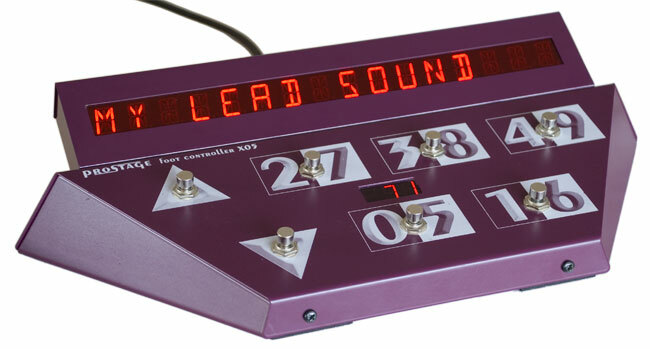 19" Audio Looper | Function Switcher. Adaptor | MIDI Mapper | Channel switching. Big Floorboard to recall up to 999 presets. Compact Foot Controller for 7 instant acces or presets. Compact Foot Controller to recall 128 presets.